Are You Attracting Your Ideal Audience? The wonderful thing about creative people is the seemingly endless supply of unique ideas and visions they generate. Walk the halls of museums, galleries, performance venues, studio spaces, recording studios, theaters - or even down a city street - and you will see myriad unique creative expressions. Just when we think we've exhausted a concept or medium, someone comes along who pushes it further. So it's easy for us to get wrapped up in what we want to say and how we want to say it. We are in service to our unique expression. But what about the audience? I always said to myself that if I liked what I was making, someone else would like it too. And, I've found evidence for that to be true. But as I've gotten older I've started to think more about audience during and even before making the work. I've realized that I want my work to have a larger impact, not just on any old folks, but on those who would be inspired, entertained, educated, uplifted, provoked and served by the work - in short, my ideal audience. 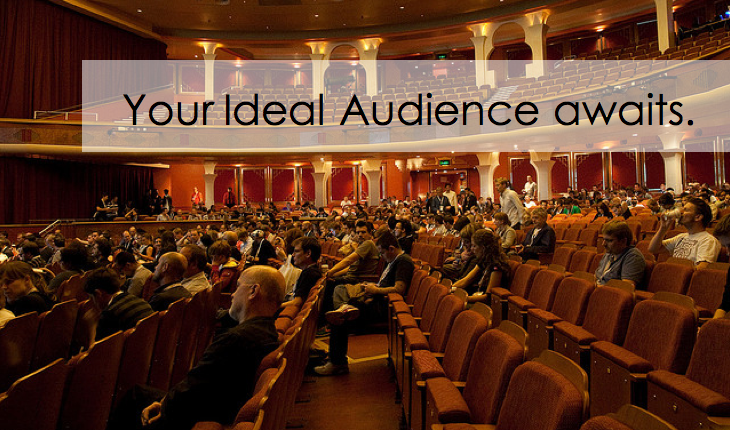 How do we attract our ideal audience? We get clear about who they are and what they want, and we consider them when making our work. Who are they? How many people am I willing to inspire and serve with my creativity? What type(s) of people are these? What are their personalities like? Where and how do they spend time? What do they enjoy? What do they hate? What do they want? What does my ideal audience crave on an emotional level? Do I want my creative work to uplift and inspire? Educate and inform? Comfort and soothe? Provoke and stimulate? Bring laughter and joy? Enrage and spur? How many of them are there? Is my art something that would appeal to a wide range of people or a small niche? (For example, if you write radio-friendly pop songs, your work likely appeals to the masses. However, if you are a conceptual artist making work out of, say, menstrual pads, we can safely say your work will appeal to a much smaller group of people.) Consider the size of your audience you want to attract and impact. How can I best serve them? In addition to my usual creative work, what additional offerings, classes, books, seminars, objects, shows, gigs, teachings, videos, articles, guests posts, murals, commissions, etc. can I offer my ideal audience so they have the emotional experience I want them to have? When you get clear about your ideal audience, and keep them in mind when creating, it can assist you in making decisions about the art along the way as well as the vehicles and methods in which you get it out into the world. It may even dictate content if, for example, you're a screenwriter or non-fiction writer. These inner exercises coupled with outer action steps - such as social media, press and publicity, hiring a support team, working with compatible venues, and more - will help find and expand your ideal audience. Photo above by Alper Cugun.